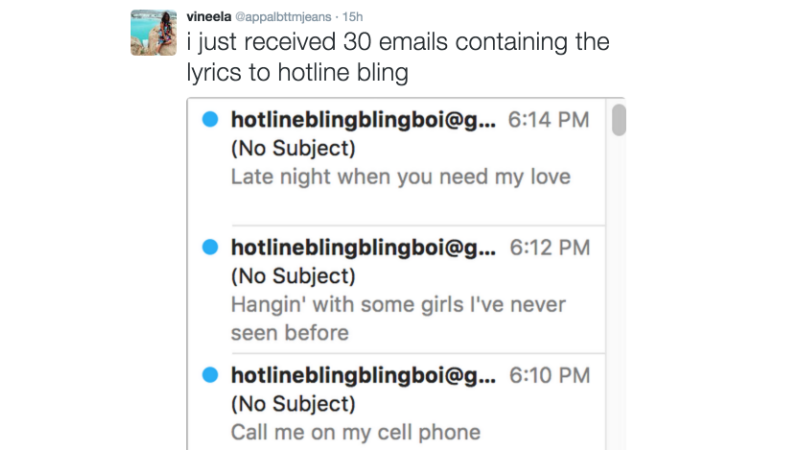 On Wednesday night, reports the Michigan Daily, students at the University of Michigan received a flood of emails from “hotlineblingblingboi@gmail.com,” each containing a line from Drake’s single. “Michael!!!!!!!!!!! U r not funny! I don’t care if u had to build a bot for class! !” texted Michael’s friends to him, probably. “You may not communicate or act under the guise, name, identification, email address, signature, or indicia of another person without proper authorization, nor may you communicate under the rubric of an organization, entity, or unit that you do not have the authority to represent,” the SPG 601.19 guideline states. Students, be warned: do not communicate as “hotlineblingblingboi” if you are not legally identified as “hotlineblingblingboi” and accurately representing the hotlineblingblingboi community.